This robot, called Beef Shredder, was designed to pick up soccer balls with a conveyor belt. It had a 4-wheel drive and featured an original design transmission from the TechnoKats. Much of the framework was based on the 2001 robot’s framework. One thing that was special about our robot was the shifting transmission. 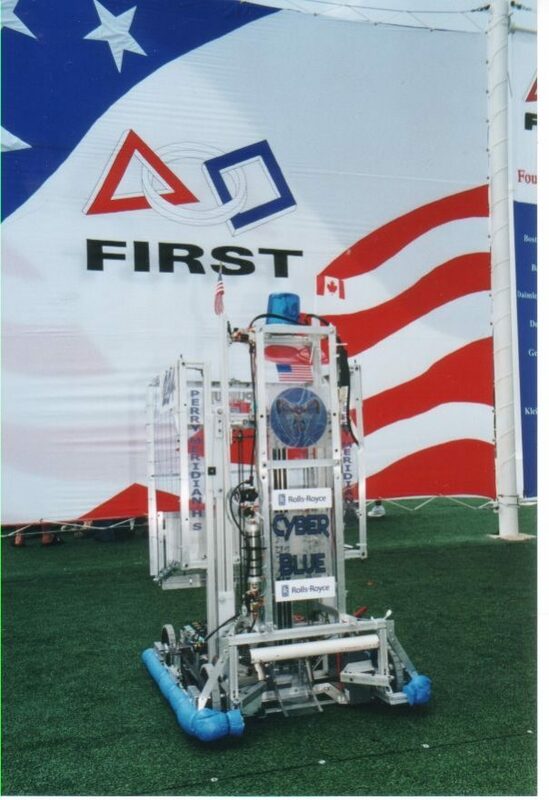 In high gear, we were one of the fastest robots. We were able to carry a lot of soccer balls in our basket and drop them into the goal each match. Beef Shredder had a shifting transmission. The name for this robot came mainly from Scott Ritchie talking about his cows. As we went through the design phase, we were planning on using metal treads. As both became commonplace in meetings, David Kelly and Mr. Ritchie eventually came up with the name Beef Shredder, and even though we later took out the metal treads, the name stuck, and our robot was to be known as Beef Shredder. Also, at the awards ceremony at Disney World in Florida, as the closing ceremony, Mandy Moore came out to sing. And since most of the audience didn’t “enjoy” listening to Mandy Moore, she ended up performing in front of a several thousand empty chairs. We ranked 10th place at the Cleveland Regionals, managed to rank 5th in Archimedes division at Nationals, and at IRI, we placed 10th.